For the past five years, opening day at the Minnesota State Fair has also meant STEM Day at the State Fair. STEM – short for Science, Technology, Engineering and Math – is arguably the most talked about education and workforce development topic today. STEM Day at the fair focuses on introducing students (K-12) and their parents to the opportunities a STEM education can provide by developing critical thinking, collaboration, and problem-solving skills – skills necessary to compete in today’s global economy and critical for every public works professional. In search of an opportunity for public outreach at the grand daddy of all state fairs for the past few years, the Minnesota chapter's Public Awareness Committee thought they may have found the perfect fit: APWA-MN and STEM. From all accounts, they did just that. Participation as a vendor/exhibitor at STEM Day is limited and requires a successful application. Due to the chapter's membership consisting of STEM professions and including members from across the entire state, the selection committee agreed that APWA-MN should join the team. Flanked by students testing their self-propelled rocket making skills and demonstrations by high school robotics teams, the APWA test drive – otherwise known as "Godzilla versus Roundabout" – was the highlight of STEM Day for many of the students as they demonstrated their driving skills. Attendance at this one-day event set at Carousel Park (near the Grandstand) within the fairgrounds, continues to grow in popularity, and provided the perfect audience for the chapter's inaugural outreach effort at the fair. 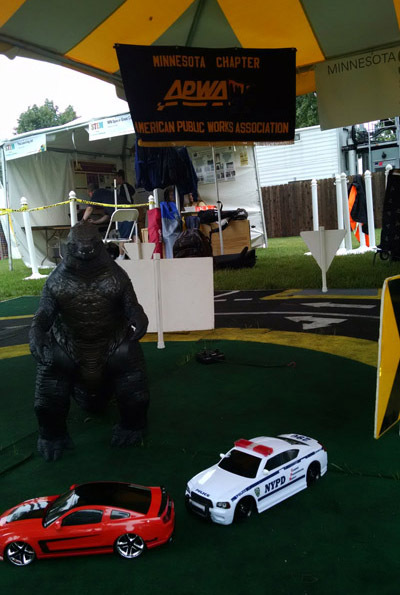 Visitors to the APWA-MN tent were consistent throughout the day as evidenced by the 200 students who signed up for an opportunity to win one of the four cars used for the roundabout training, as well as the mascot for the event, Godzilla. Additional students, parents, and grandparents watched the drivers test their skills on the roundabout model provided by the Washington County Public Works Department. Information on roundabouts was provided, including some MnDOT navigation advice on a stick (what else would it be on?). Casual roundabout conversations with some visitors may have even won a convert or two. A preview of the MN2050/TPT production of "Roads and Bridges" was also available for those less inclined to drive a race car, but interested in the condition of our public infrastructure, none the less. By the end of the day, after replacing nearly 100 batteries and presenting the well-used cars to the winners, all of the APWA-MN member volunteers concluded it was a day well spent. While only a few of the STEM Day attendees may even remember what APWA-MN stands for, there are at least a couple hundred students/future race car drivers that understand that STEM and APWA-MN are fun and subjects that just may be worth looking into more as they grow into our future leaders. Like the unclaimed Godzilla, APWA-MN plans to return to STEM Day 2015 for more fun and to reinforce that math and science are essential tools to help identify problems, collect data, test solutions, and solve problems. This type of learning has never been more important to our profession and our country.